A guide to the next episode of your survival in the land of the Long Dark. Includes objectives, screenshots, and tips for completing the second part of Wintermute, the Story Mode. Spoilers included as necessary. Survival Guide (Tips & Tricks). Jeremiah gives you a Hunting Rifle and some Rifle Ammunition, but the rifle is in poor condition and should be cleaned before using it with a Rifle Cleaning Kit you can pick up later. If you do use it, the rifle may jam. Reload to clear the jammed bullet, and don’t forget to pick the round up, since it doesn’t count as fired and is still good as ammunition. 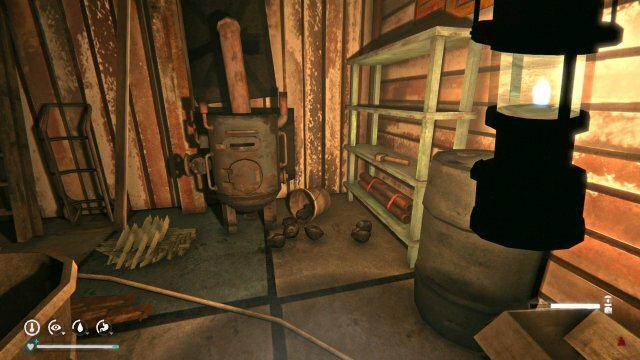 You can store the Rifle and other supplies in Jeremiah’s Supply Bin outside the Trapper’s Cabin. 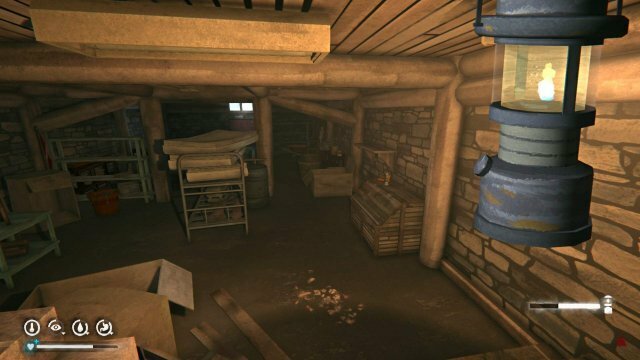 Later in the story you will be kicked out of the cabin with all loose and stored items now in your inventory, so store your items either in the bin or in the Mystery Lake Camp Office to avoid being weighed down later. 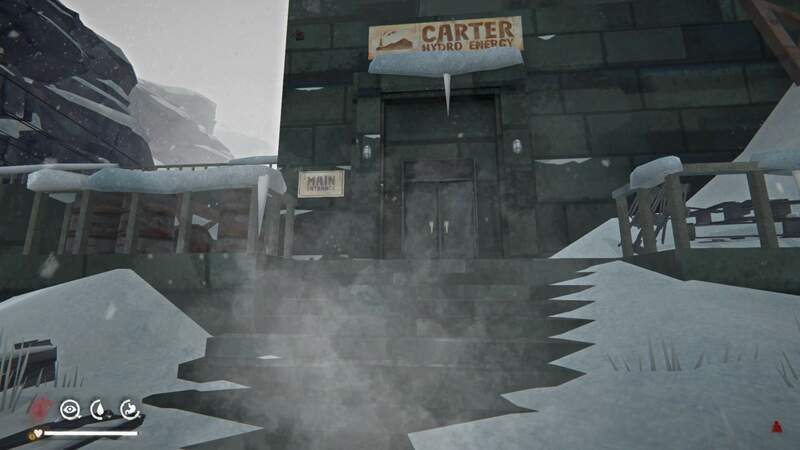 To begin your journey, leave the Trapper’s Cabin and walk toward the collapsed building nearby. Keep walking past it and you should eventually run across some train tracks. Turn left at the tracks and keep heading north to find the dam. 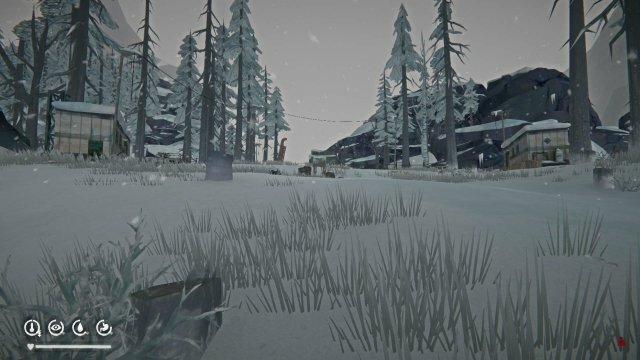 If you are low on supplies, a little farther down the tracks from the cabin is a clearing on the right leading to the Camp Office beside Mystery Lake which contains some useful items, including a Storm Lantern, a Hatchet beside the Pot Belly Stove, Whetstone on the Workbench, an extra Bedroll on the second floor, and a pair of Trail Boots beside the bunk beds. 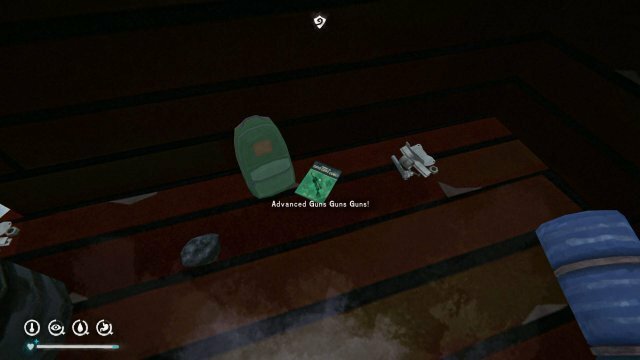 Also, there is a Hunting Knife and some Rifle Ammunition in the Ice Fishing Hut near the little island in the center of Mystery Lake. Once you’ve gathered what you need, head north along the frozen riverbed or return to the train tracks toward Carter Hydro Dam. After a short train bridge, the dam will be on the left. Watch out for a Wolf that patrols this area. To the left is a chain-link fence with a locked door, but you can open the gate using the "Carter Hydro Staging Area Gate Key” found on the desk in the trailer farthest from the train bridge leading to Carter Hydro Dam. Once you open the gate, a short cutscene plays. 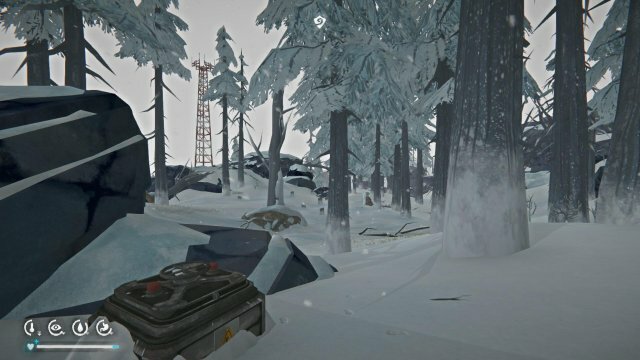 Objective: Find The Radio Parts The Trapper Needs. 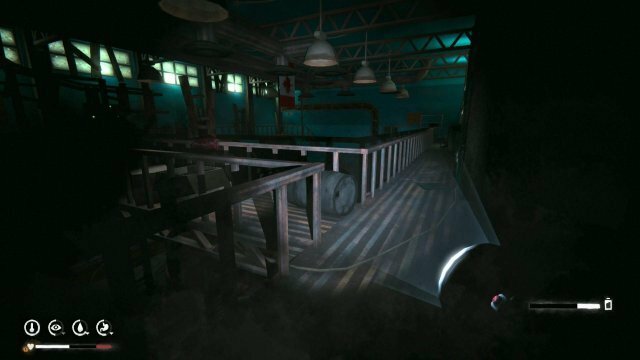 Inside the Carter Hydro Dam, there is a Storm Lantern on the desk just inside the front door. The lantern will make it easier to explore indoors without having to use up valuable Flares, Torches, or Matches. Straight across from the entrance is the Control Room with a Keypad which keeps the room locked for now. To the right is a Restroom near the entrance, and farther in on the right is an Elevator near the Control Room. Near the Restroom is a set of stairs leading to other floors. 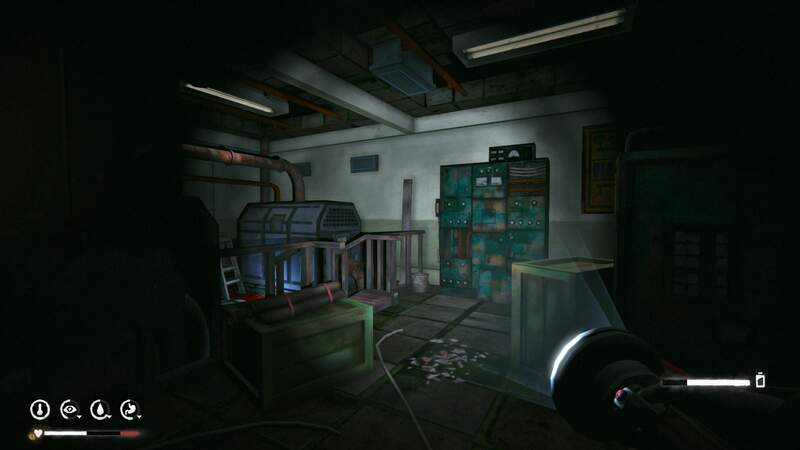 To the left is an office area and, farther in, the Turbine room. 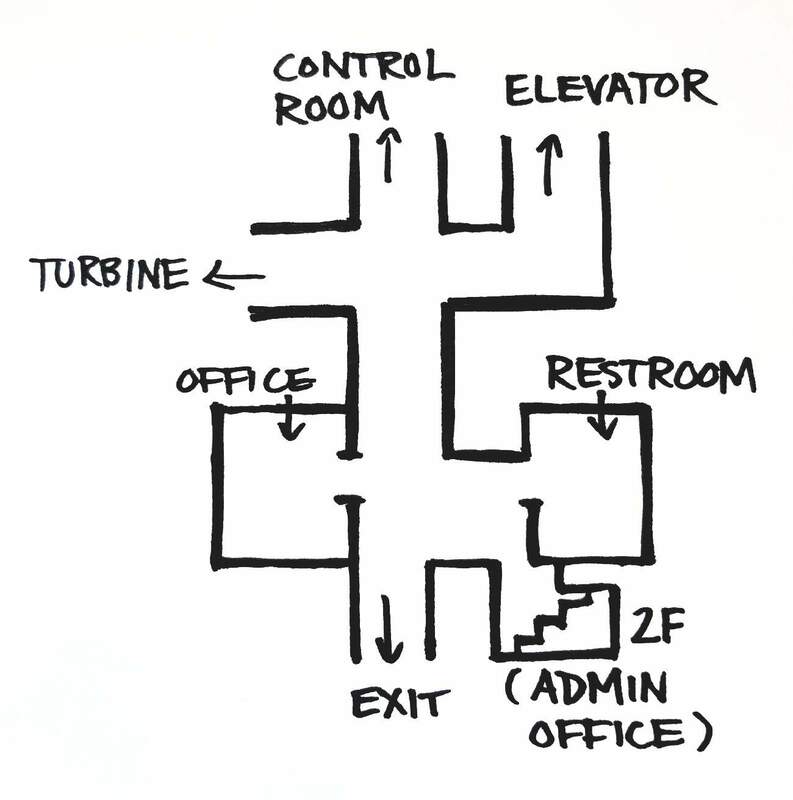 Enter the Restroom and loot the Frozen Corpse in the stall to obtain the "Admin Office Key.” Exit the Restroom and immediately turn left into the stairwell and go upstairs to the second floor. In the outer office is a Workbench. Pick up the "Radio Parts” sitting atop the Workbench. You can also take the Prybar, which is useful for opening locked car trunks and Lockers. Objective: Find Medical Supplies For The Old Trapper. 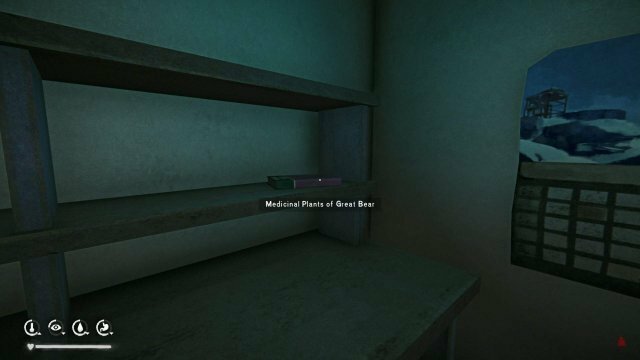 Objective: Get The Medical Supplies Back To The Old Trapper Before He Dies. This objective is not a timed event, despite the description. Follow the railroad tracks back to the Trapper’s Cabin. If it’s late in the day, you can spend the night at Carter Hydro Dam or the Abandoned Lookout, which is a bit of a climb but has some side quest triggering items. Objective: Retrieve The Legendary Spear From The Hunting Lodge. Return to the railroad tracks outside the Trapper’s Cabin, but this time turn to the right and head south toward the train tunnel. 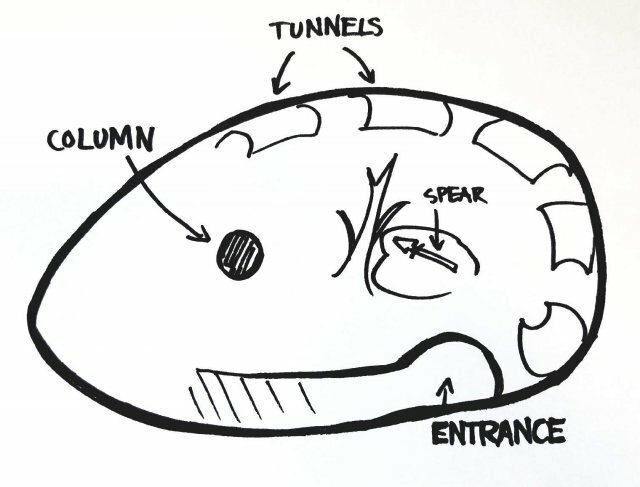 Beware of a Wolf that wanders this area—it may chase you into the tunnel but will not follow to the other side. On the other side of the tunnel is Forlorn Muskeg. The area is a partially frozen lake, full of Weak Ice, bisected by train tracks. A little less than halfway across the lake while following the train tracks are some overturned train cars. Inside the open car is the Poacher’s Camp, which can provide shelter for the night if a blizzard is approaching or if it gets late in the day. Continue following the tracks. When the tracks break up or are covered by train cars, follow as closely as possible in order to avoid stepping on Weak Ice and falling through. If you do see a Weak Ice warning, backtrack as quickly as possible. 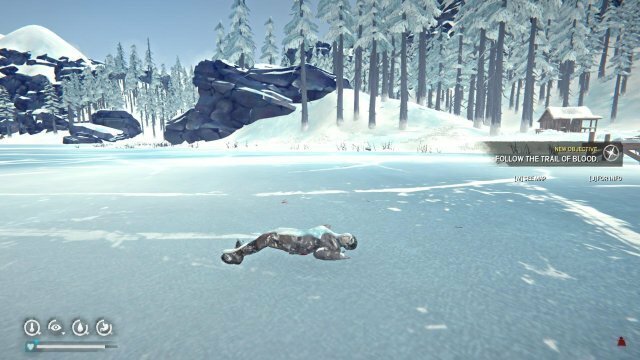 If you fall through the ice, your clothes will become soaked and frozen, and you will be at risk for Hypothermia. On the other side of the tracks is another train tunnel, which leads to Broken Railroad. Follow the train tracks, and soon your path will become blocked by a Landslide. The path is rough and hard to follow at times, but you can circle up and to the right to reconnect with the tracks on the other side. Continue to follow the train tracks until you run across the Locomotive Engine. Circle around the upright cars, and farther along the path there will be a partially buried yellow car that you can "Enter Vehicle” through the broken window. 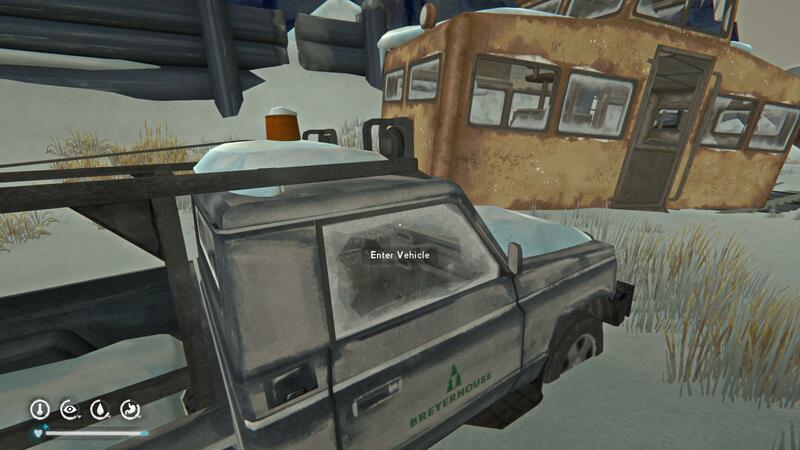 Head to the other side of the car and attempt to "Exit Vehicle” to trigger a cutscene. Head down the hill toward the light of Methuselah’s campfire. Continue to follow the lights, and you will arrive at the Maintenance Yard building. There will be several Wolves along the way that emit a strange greenish glow and don’t respond to normal scare tactics. The only thing that deters them is an electric light source. 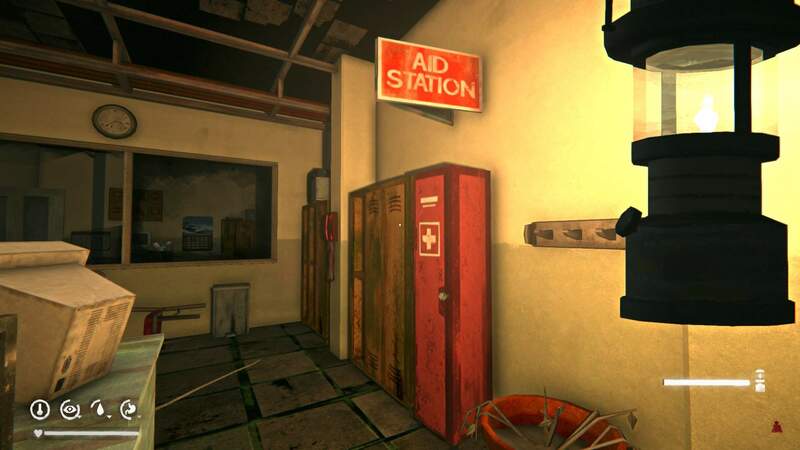 Inside the Maintenance Yard building is a Hacksaw on the desk, and there are some clothes and medical supplies scattered about which can help with recovering from Wolf attacks. Spend the night at the Maintenance Yard building to avoid the Aurora-affected Wolves, or continue at night to follow the lights toward the lodge. Head north until you run into a frozen riverbed, then turn right and follow the river until you reach a bridge. Circle up the right-hand bank, then cross the bridge and open the gate on the other side. Follow the path up the hill and down the snow-covered road. On the left is the Hunter’s Lodge. 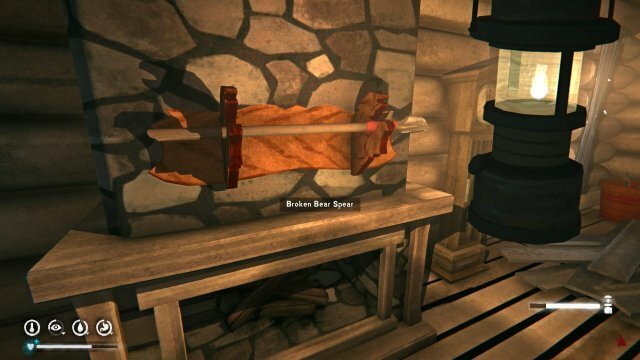 Enter the lodge and, once inside, turn left and pick up the Broken Bear Spear above the fireplace to trigger a short cutscene. Objective: Repair The Broken Bear Spear At The Forge. The Forge blueprint for the Spear Head unlocks. The phone on the wall will ring in a few seconds, even when the Aurora is over, but you are not able to answer it. Before you leave the Hunting Lodge, head down the stairs into the basement. 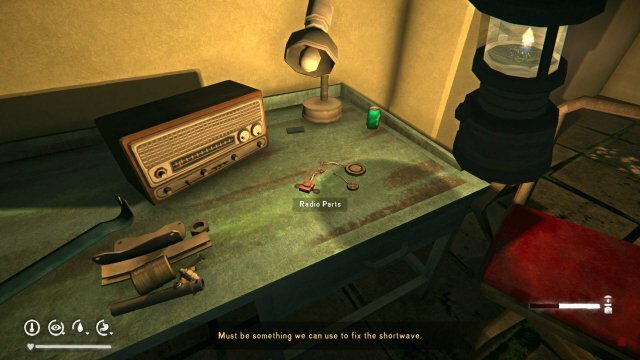 The Flashlight is sitting atop some furniture at the bottom of the steps, and a table in the center of the room holds a Rifle Cleaning Kit and some Rifle Ammunition. There is a Mountaineering Rope on the floor next to a Metal Container filled with Flare Shells. The upstairs also has a good stash of food items and some extra clothes. You may want to take some time to sharpen your tools, repair your clothing, and clean your Rifle. The Rifle Cleaning Kit has twenty uses and (based on current Rifle Cleaning skill) will improve the Rifle’s condition up to 86 percent. Head back to the Maintenance Yard building. Looking from the entrance, on the left wall is an Authorized Employees Only door leading to the Maintenance Shed. Inside the shed are several fallen wires that spark with electricity during an Aurora event, but you can circle around to the left side of the room to avoid them. Be careful not to touch any part of the wire, or you will quickly die; even a quick touch cuts your Condition in half and causes electrical Burns. On right side of the room you will find an office. Turn left before heading into the office, and you will see a Forge along the back wall with some Coal, the Heavy Hammer, and a red box of Quality Tools which can repair the Hacksaw. 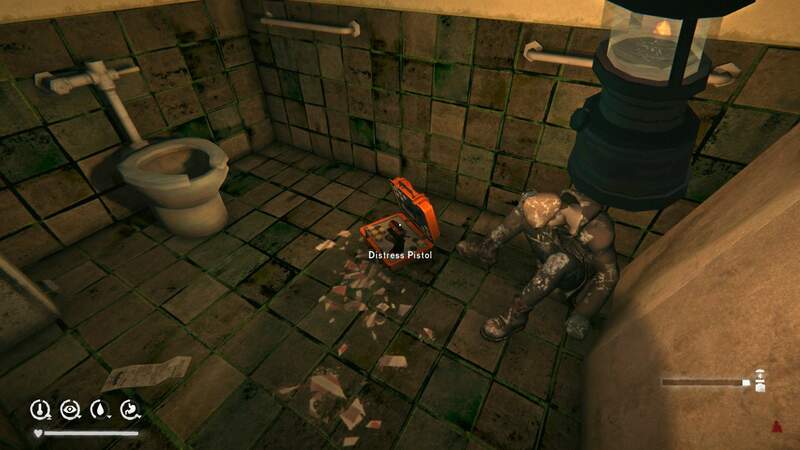 The bathtub near the Forge has some Scrap Metal inside, or you can use the Hacksaw to break down metal objects to obtain at least 2 pieces of Scrap Metal. Start a fire in the Furnace below the Forge. The fuel you choose doesn’t matter; once the fire is started, a short cutscene will play, and the burn time will change to the infinity symbol. You will need the Heavy Hammer and 2 or more pieces of Scrap Metal in your inventory. Crafting the Spear Head will take 1.5 hours. 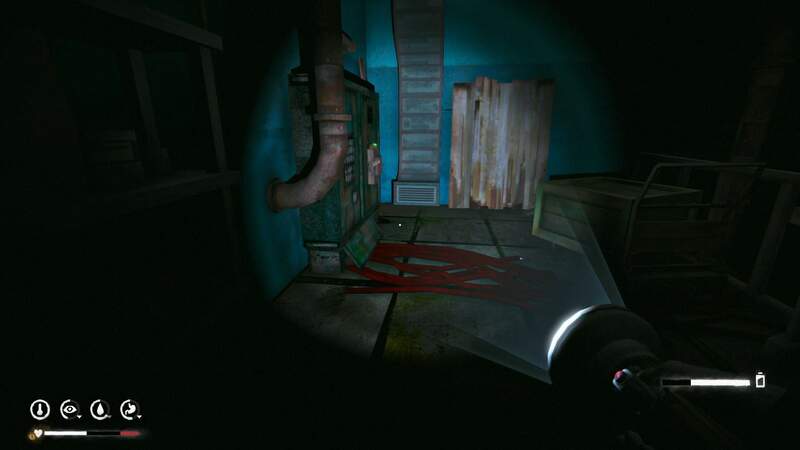 Another short cutscene will play, and the blueprints for the Improvised Knife and the Improvised Hatchet will unlock. Objective: Get Back To Jeremiah. It’s a long walk back to Mystery Lake, so try to get an early start. From the Maintenance Yard, head through the front gate across the building’s open door until you come across the railroad tracks and turn left. At the Locomotive Engine, use the planks to climb up the yellow car and cross to the other side. 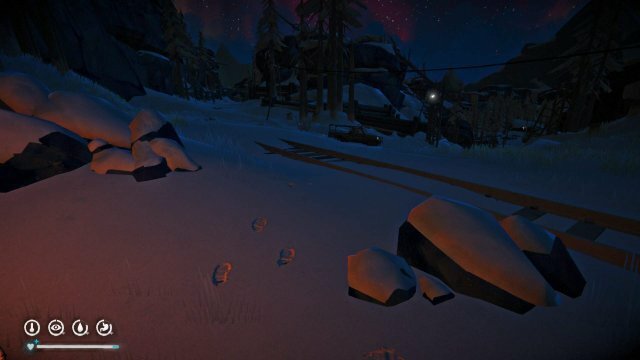 Follow the snow path until you meet up with the tracks again. Farther along the tracks at the Landslide, circle up and to the left but beware the drop-off. 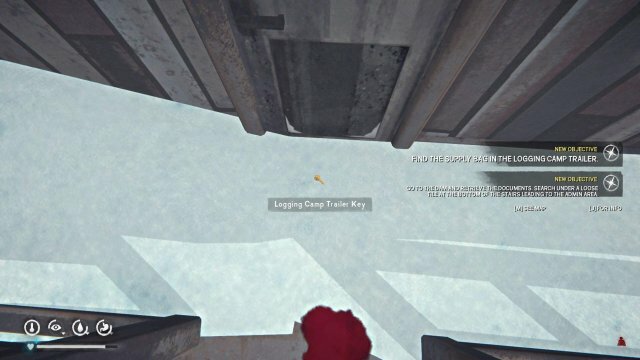 Keep going until you reach the train tunnel. 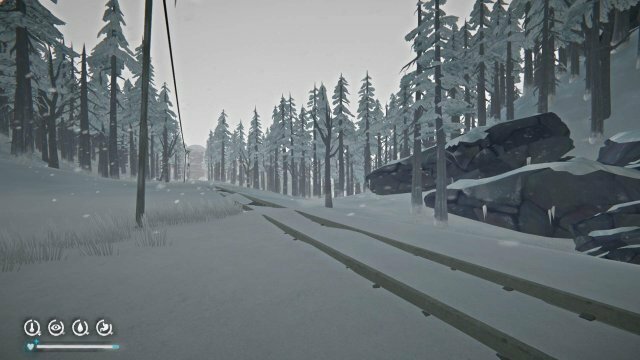 On the other side of the tunnel in Forlorn Muskeg, circle around the overturned train cars and continue following the tracks across the frozen lake. The Poacher’s Camp train car is a good layover spot if you run out of daylight or good weather. 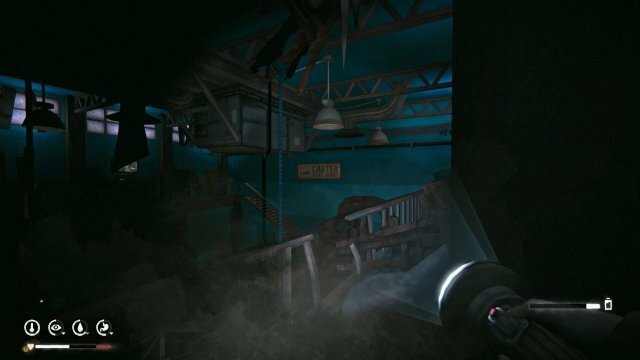 When you approach the train tunnel leading back to Mystery Lake, a cutscene will activate. Continue through the tunnel to the other side. Once through the tunnel, immediately turn left and head for the Trapper’s Cabin. Enter the cabin to trigger another cutscene. Objective: Retrieve Transponder Parts From Each Tower In Forlorn Muskeg. There are three Shortwave Towers in Forlorn Muskeg: the north tower, the broken southwest tower, and the southeast tower. Each tower has a box fixed to the tower’s base which contains the needed parts. The bear will appear at the second two towers, depending on which order you visit them. Head south from the Trapper’s Cabin to the train tunnel to return to Forlorn Muskeg. This time, instead of cutting across the map on the train tracks, circle around the lake on the outer banks, starting north first then coming south to circle back to the eastern train tunnel. The outer banks have several Maple and Birch Saplings which you can gather, although you will not need them for Episode Two. The north ShortwaveTower can be accessed from the west side. Open the Shortwave Tower Box to obtain the Transponder Parts. There is also a wooden Supply Bin nearby. Then, head south toward the bottom left corner of the map. You can try to cut across the frozen lake, but it would be safer to continue around the outer banks. If you do choose the lake path, stick to areas covered by snowdrifts whenever possible and avoid sprinting across frozen water to prevent getting caught by Weak Ice. The broken southwest tower is near the Old Spence Homestead. You can access the tower from a path to the southeast. Before you approach the tower, get the Bear Spear ready: once you get close enough, the bear will appear. He will roar, rear up, then rush toward you to attack. Before he reaches you, the Bear Spear must be fully lowered into position (using the fire/attack button). You will have to time your attack so that the spear is ready before the bear reaches you but not so early that you run out of energy to hold the spear. 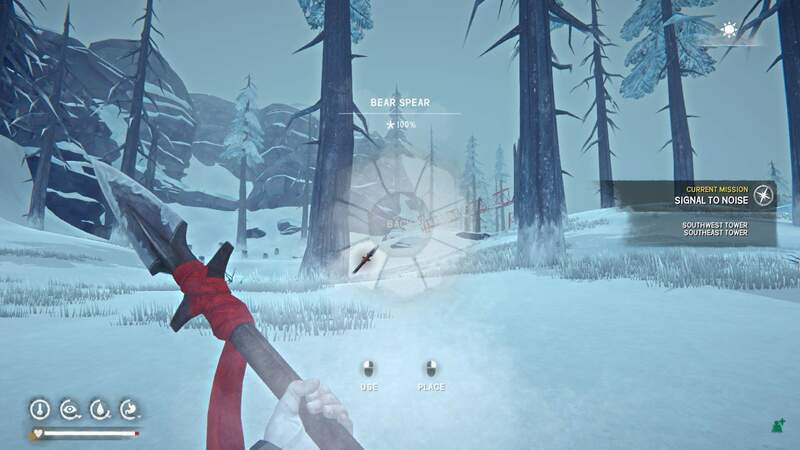 When the bear attacks and you have the Bear Spear in position, you will be able to "Fight Back” just as you would during a Wolf struggle. You won’t be able to win against the bear yet; you just have to hold your own, but performing better during the struggle can limit the damage you receive. 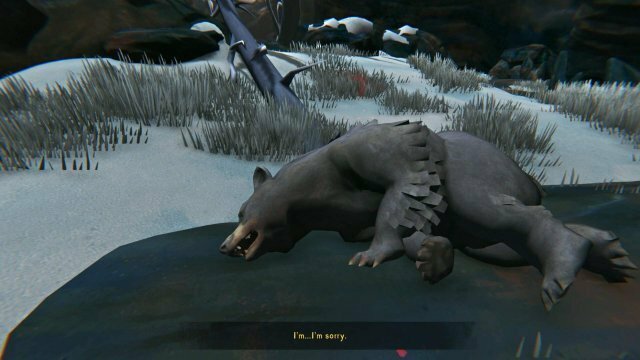 After the struggle, the Bear Spear will be lying on the ground at your feet. Immediately pick up the spear, ignoring any injuries including Blood Loss, and prepare for the bear’s second attack. Once you defend against his attacks, the bear will leave. The bear may attack two or more times, so wait for Will to remark on the bear’s exit. Treat any Blood Loss immediately, then retrieve the Transponder Parts from the second tower. There are several natural remedy ingredients around this tower in case your medical supply is low. Before going to the third tower, check your clothes for Condition loss due to the attack. If the Condition is too low, the clothes may become Ruined during the next set of attacks. Continue along the outer banks past the Old Spence Homestead and the Bunkhouses toward the Mystery Lake train tunnel. The final tower has a tiny path between the mountains with a path leading uphill. There is a flat area with an abundance of deadwood, a gathering of rabbits, and a view to the tower through the trees. Get the Bear Spear ready. As you approach the tower, you hear the roar of the bear. This time, he will attack until you defend against his attacks again before he leaves. 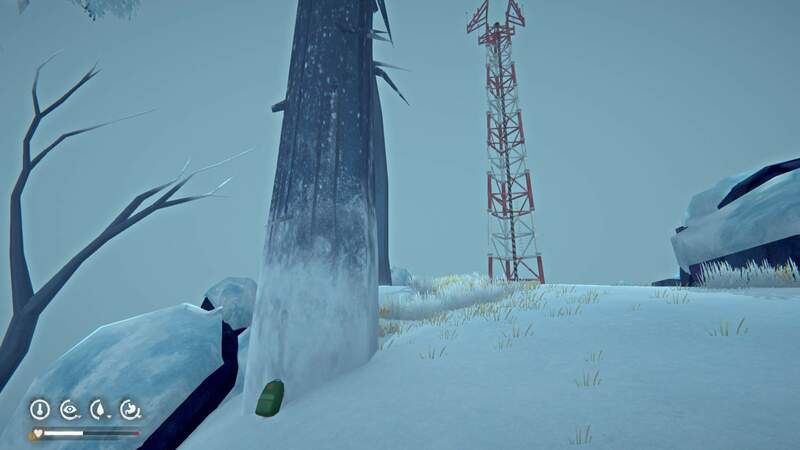 Near this tower is a Backpack with limited supplies and a hollowed tree that is able to shelter a fire. Retrieve the final set of Transponder Parts from the signal tower. Objective: Bring The Transponders Back To Jeremiah. Treat any injuries and rest at the Poacher's Camp to recover your Condition as much as possible before proceeding to the next mission. Once you have treated your injuries, return to the train tunnel leading to Mystery Lake. 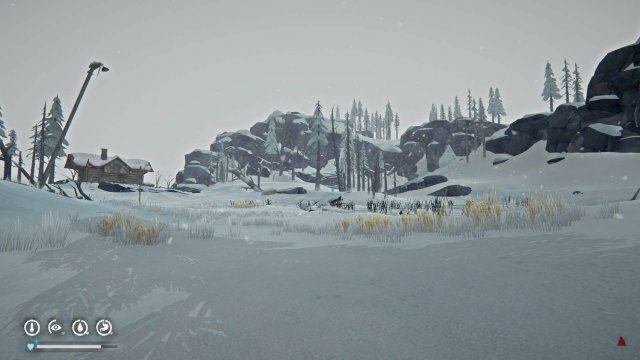 The moment you try to leave Forlorn Muskeg, the bear will surprise-attack you, and you will be unable to defend yourself. Objective: Search The Cave For Your Bear Spear. You wake up in the bear’s den, weaponless, itemless, and ragged. The bear is nearby, distracted by a Wolf carcass. Take care not to approach the bear, or he will ravage you to death. If he stops to sniff the air, you’re getting too close. Getting past the bear can be difficult, but fortunately this mission has several checkpoints, the first of which is waking up in the cave. To your left is a wall with some roots you can climb. At the top, turn around and continue along the ledge to the left. 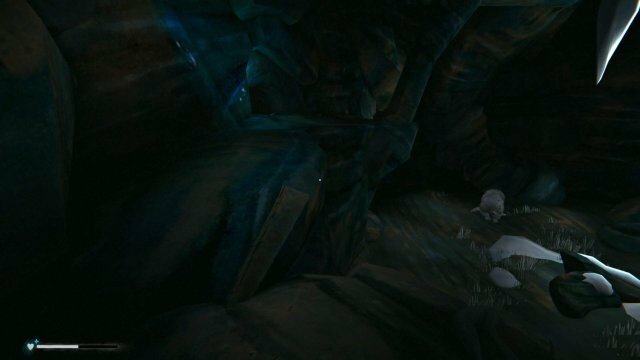 There will be a small opening with a passage leading to a larger cave system. 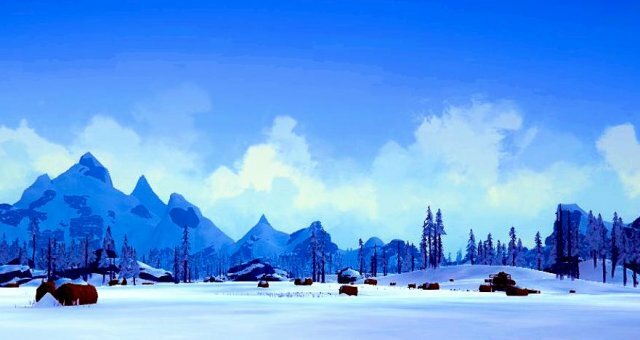 Stepping onto the snowy patch is the next checkpoint. Turn right and follow the tunnel, but beware the hole in the floor leading directly into the bear’s clutches. At the end of the tunnel is a ledge beside a large hollow room with a waterfall. The bear wanders into the room and begins to patrol in a triangular patter. He heads for the corpse on the left side of the room, sniffs it, then wanders to the opposite side of the room, sniffs the ground again, then wanders toward the entrance ledge, sniffing the ground once more. Follow the ledge along the right-hand side. The ledge ends in a small downhill slope. 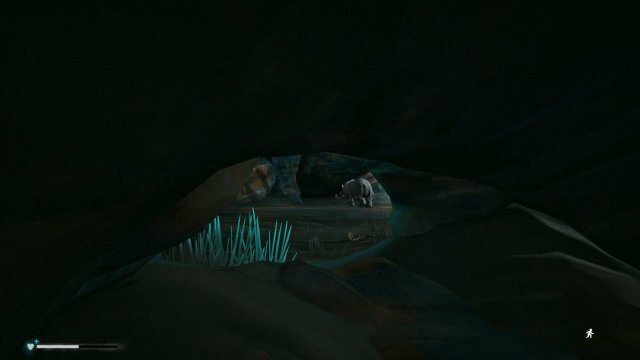 Wait for the bear to approach the corpse on the opposite side of the room, then sprint for the small cave opening across from the slope. You will have to crouch to enter. If the bear spots you, he will roar before charging; if he loses sight of you, he will make the running-scared sound and resume his patrol. Watch the bear’s movements from the cave opening, taking care not to step out of your shelter. As soon as he is starting to head away from you on his patrol, move to the other side of the cave, leave the shelter and sprint for another cave opening on the opposite side with a small river flowing down into it from the waterfall in the middle of the room. The tiny river ends with another cave passageway to your right. Reaching the end of the river is the another checkpoint. 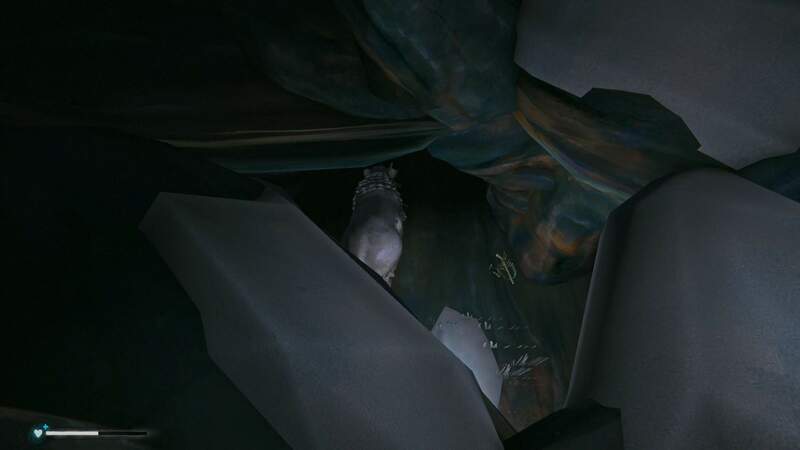 Proceed slowly through the cave opening, then back up as soon as you see the bear again. Allow the bear to meander toward the back of the room as he begins another triangular patrol, following at a safe distance, then crouch to enter through a cave opening on your left. Follow the cave until it forks. On the left is a small room with a Frozen Corpse carrying an Emergency Stim and a Bandage at its feet. On the right is a snow patch with some Painkillers. 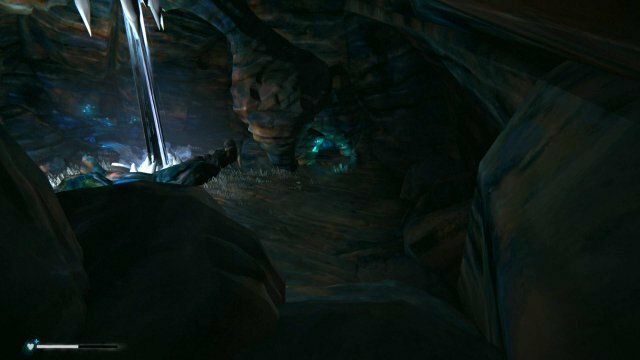 Continue through the right-hand passage to reach another small cave opening and the next checkpoint. This time the bear’s patrol pattern is slightly shorter on the second leg of the triangle. Follow at a safe distance while the bear walks away from the opening you entered through, then when the bear turns to make the next leg of his patrol, sprint for the cave opening across from the entrance and crouch to enter the cave shelter. There are openings in the rock that you can look through to observe the bear’s progress. 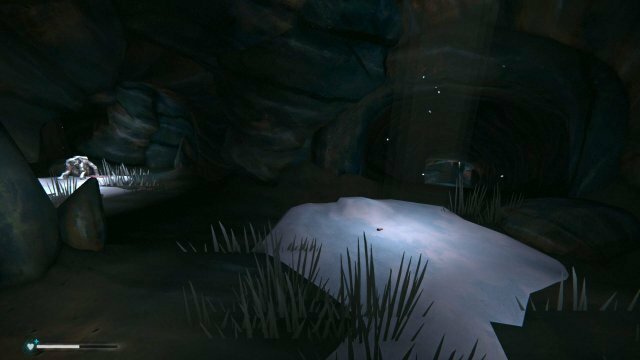 Wait a few seconds for the bear to turn away, then leave through the other side of the shelter and sprint across the room to a third cave opening leading to the snowdrift room and the final checkpoint. Lying on some rocks beside an uprooted tree is the spear. The bear enters the room from the bottom right and begins to patrol. Like before, he investigates each corner of the room, but this time his pattern is more random, so you will need to pay attention to where he is heading. However, shelter tunnels are more numerous and closer together here, and there is even a shelter in the column. Maintaining a safe distance from the bear, turn left and descend the slope, then circle around the column along the left and sprint for the first cave opening, crouching to enter. Proceed along the outer wall as the bear’s movements permit. Once he moves far enough away, sprint toward the rocks by the tree and grab the Bear Spear, equipping it immediately. Prepare to face the bear. This time when he attacks, you will need to win the struggle. Fill the "Fight Back” bar before he finishes his attack. You may have to fight him more than once, but getting attacked will no longer instantly kill you. If you need time to treat injuries, sprint to one of the tunnel-shelters. Also, sometimes the Bear Spear disappears into the ground when dropped, but usually some portion of the spear point or red wrapping on the handle is showing. 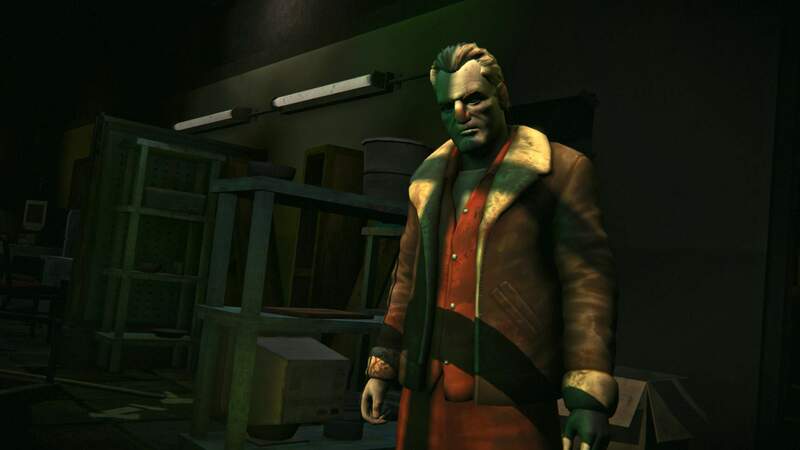 Once you have defeated the bear, a short cutscene with the bear will play, followed by another cutscene with Jeremiah. 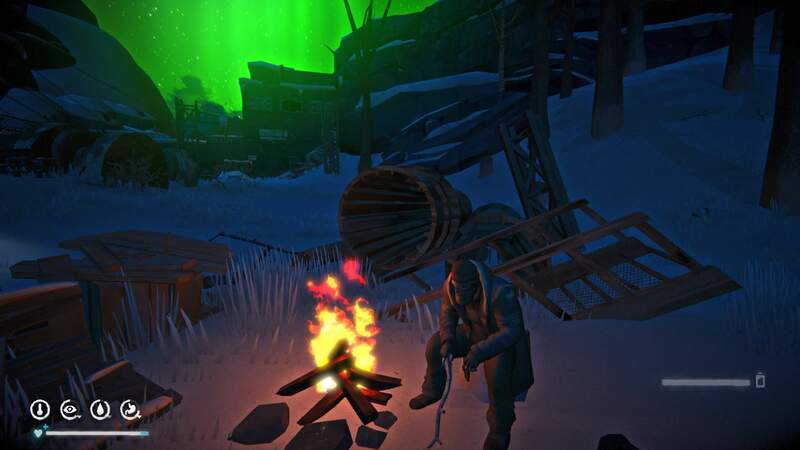 After the cutscenes, you will be permanently kicked out of the Trapper’s Cabin with all the items previously inside the cabin now held in your inventory. Store unwanted weight in Jeremiah’s Supply Bin outside the cabin’s door. Objective: Get Into The Dam At Night, When The Aurora Is In The Sky. 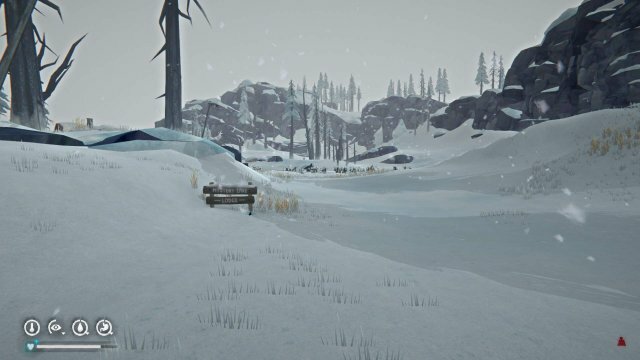 Use the time to sharpen tools, repair clothing, gather food or fuel, and make a comfortable camp for yourself near the Carter Hydro Dam. You can stay in the Camp Office near the Mystery Lake Ice Fishing Huts, or if you already have a good stash of food you can move to one of the trailers outside the dam or even inside the Carter Hydro Dam itself. The Aurora is randomized; it may occur the first night, or it may not appear for several nights. On the night of the Aurora, head to Carter Hydro Dam, if you are not there already. Outside the entrance, Methuselah sits beside his campfire, and you can talk with him if you choose. 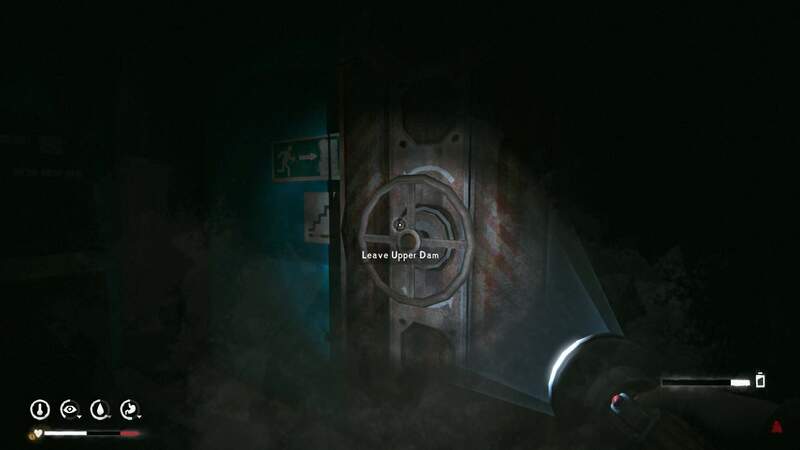 Objective: Find Your Way Through Carter Hydro Dam. Once inside the dam, head straight for the Control Room in the back. Click on the Keypad, and Mackenzie will input a code he learned from Jeremiah. 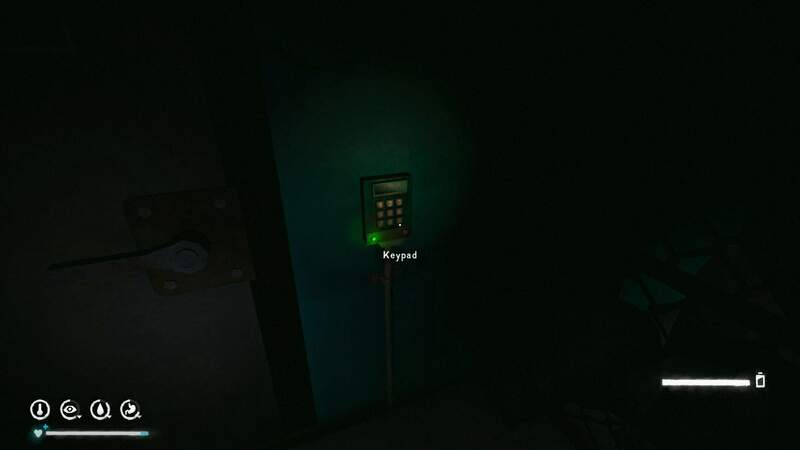 The light on the Keypad will change from red to green, and the door will swing open. If you don’t have one already, there is a Flashlight on the table immediately to your left after you enter the Control Room. 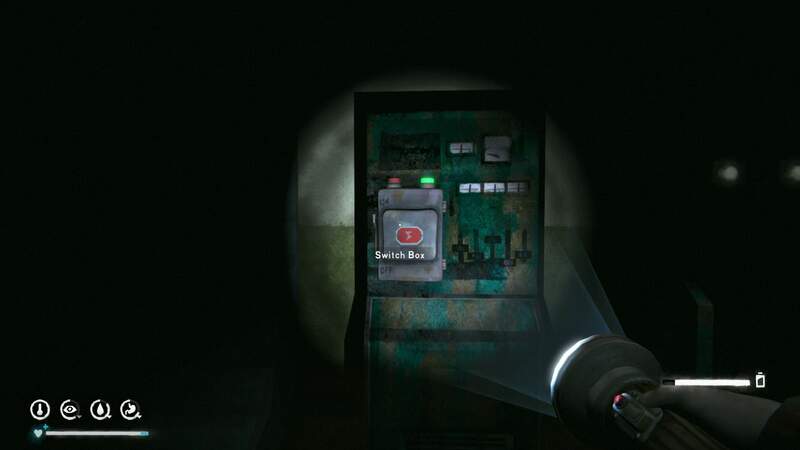 Activate the Switch Box on the wall to your right. When leaving the Control Room, turn left toward where the Elevator awaits. Press the Call Elevator Button, and the elevator doors will open. Enter the Elevator and press the second Call Elevator button panel inside. 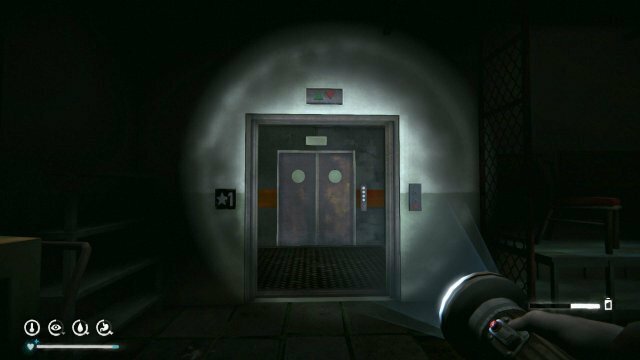 The Elevator will become stuck with the doors only partially open. In the corner of the Elevator is a Frozen Corpse clutching a Backpack. The Backpack contains a Prybar and some Painkillers, both of which will be useful if you don’t have them with you already. 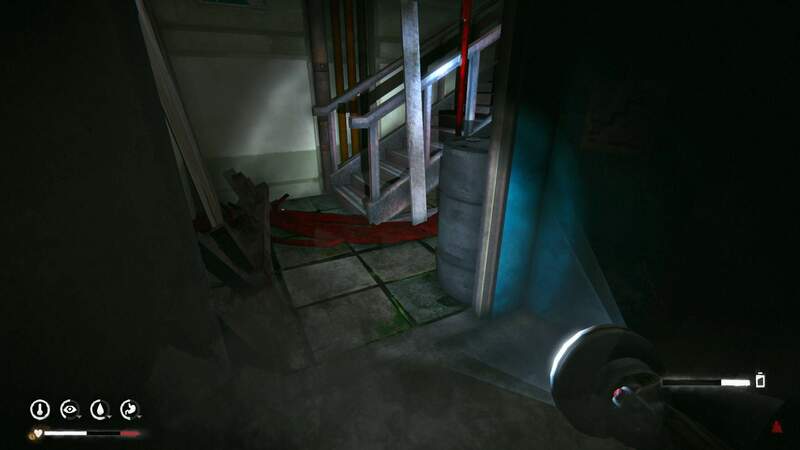 While holding a Prybar in your inventory, force open the elevator doors and walk through. Objective: Explore The Guts Of The Dam. Exit the Elevator and turn right. There will be some electrified wires blocking your way. Take care not to step on any part of the wire, or you will be badly burned. There is a small open space to the left of the wires that you can squeeze through. 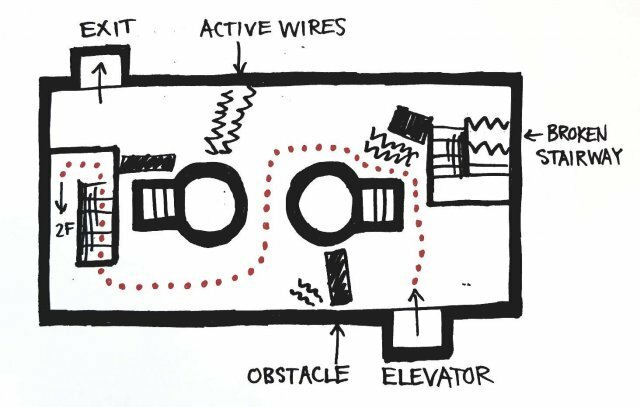 There will be more wires ahead of you and a wooden Crate to your left near the center of the room. 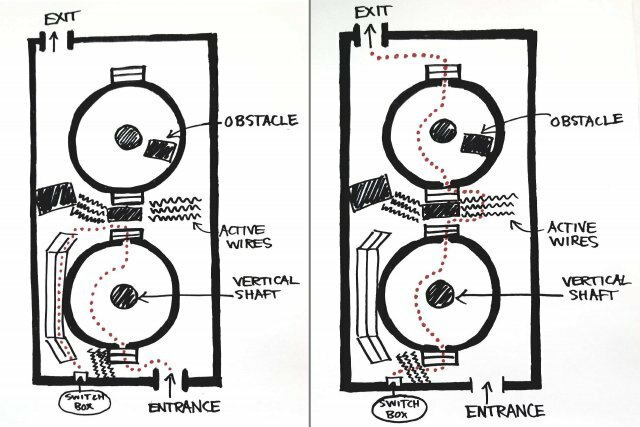 Turn left at the crate and circle around to the right until you see a set of stairs against the far wall. Go up the stairs and follow the catwalk running along the wall. 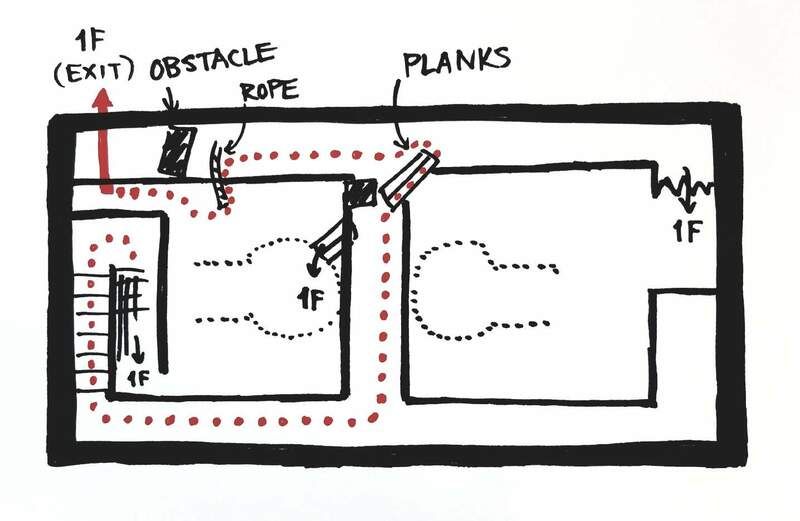 When the catwalk splits in the center of the room, turn left toward the opposite side of the room, and continue across the wooden Planks on your right to the next catwalk. Follow the red passageway, and it will lead to a room with two openings. On the left side is an Emergency Exit door with another Keypad, but the door will not open at this time. Continue straight through the room until you hit a wall. To your left are some active wires and a green Backpack containing the Wool Ear Wrap accessory. (Note: Do not attempt to search the Backpack while the wires remain live.) 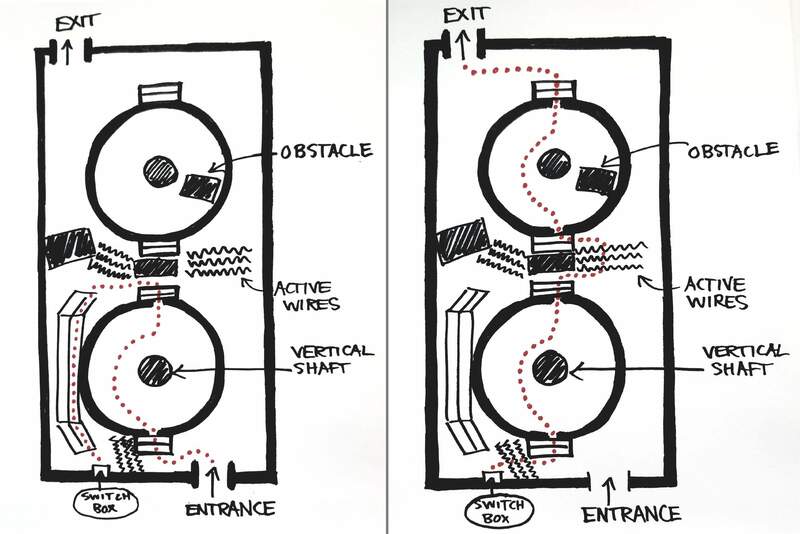 Turn right and go down through a short red passage toward the next room with two vertical shafts with raised circular platforms, and a checkpoint will activate. To your left are some active wires protecting a Switch Box. Head straight across the room past the first shaft. There will be a stack of wooden Crates with active wires on either side preventing you from proceeding further. Turn left and squeeze around the wires to find some inclined wooden Planks forming a narrow passage along the wall. Follow the passage and turn off the Switch Box to deactivate the wires. Now you can proceed safely across the room to the exit on the left side of the far wall. On the other side of the exit are some more active wires. Run across these as quickly as possible to minimize the damage, or wait until the morning for the Aurora’s effect to end. Ascend the stairs to the very top. 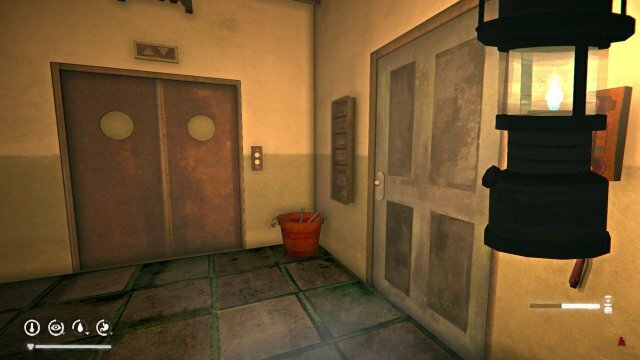 Once you enter the room, you will be hit on the head, and a cutscene will play. Side quest "The Basics of Survival” is triggered by reading a skill book for the first time. This quest can be completed in Episode One or triggered for the first time in Episode Two. The side quest "Survival School” is an Episode Two continuation of survival skill practice, which may be confusing if you have not yet completed Episode One’s "The Basics of Survival.” The quests activate and complete separate from each other, but both include three skills subquests triggered by picking up a related survival skills book. 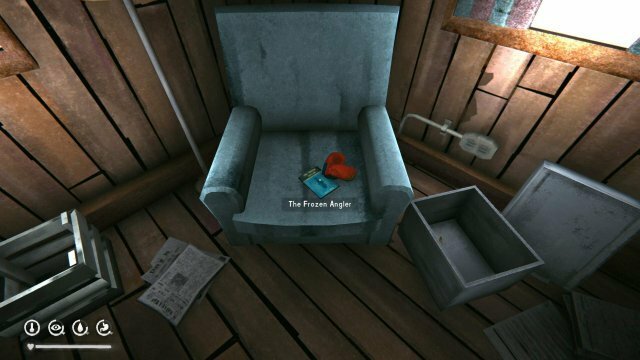 In the Camp Office in Mystery Lake is a blue armchair with a copy of The Frozen Angler, which when picked up unlocks the blueprints for the Hook, Line, and Fishing Tackle, and triggers the quest to catch 5 kg of fish. 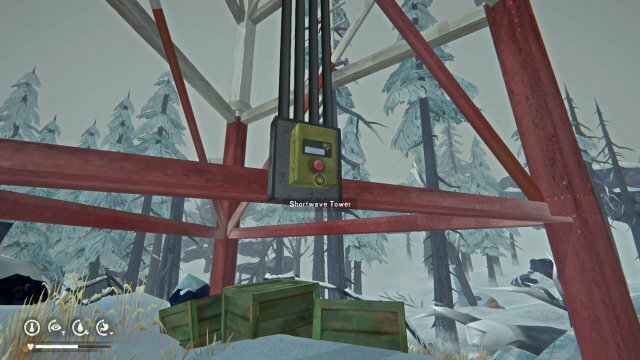 Use the Prybar (or other tool) on the frozen fishing holes in the Ice Fishing Huts on Mystery Lake, then click on the hole to begin fishing. Inside the Hunter’s Blind by the Unnamed Pond north of the Trapper’s Cabin is the Frontier Shooting Guide. Picking up the book triggers the quest to kill a deer. Even if you don’t bring down the deer in one shot, the deer will eventually bleed out and the quest will mark as complete. Inside the open rail car in the Poacher’s Camp is a copy of Advanced Guns Guns Guns! 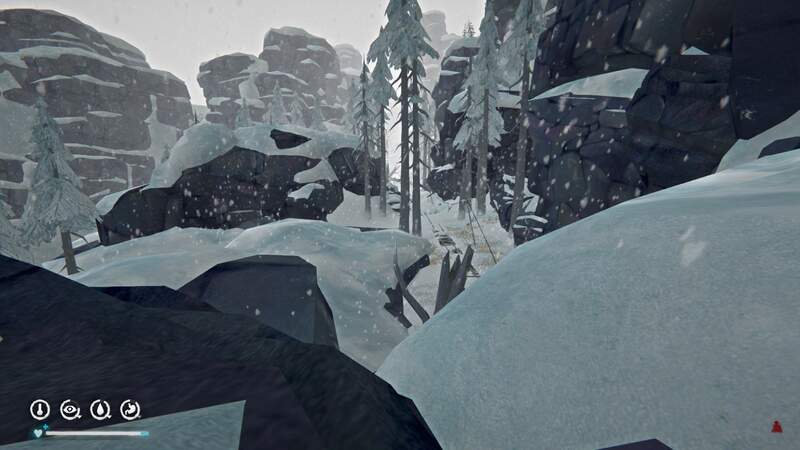 which triggers the quest to kill one Wolf in each of three areas: Broken Railroad, Forlorn Muskeg, and Mystery Lake. 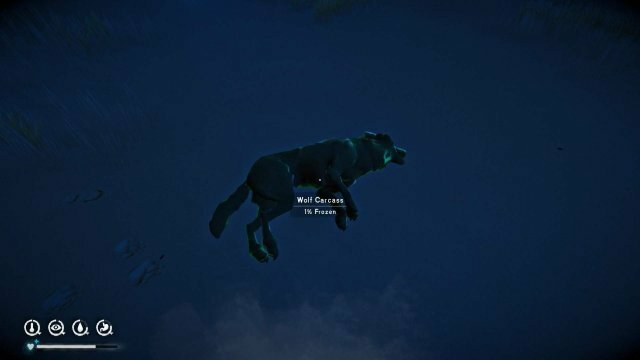 Wolves can be killed either by shooting them with the Rifle or by bleeding out after receiving injuries in a struggle. Completing this subquest unlocks the blueprint for the Wolfskin Coat. 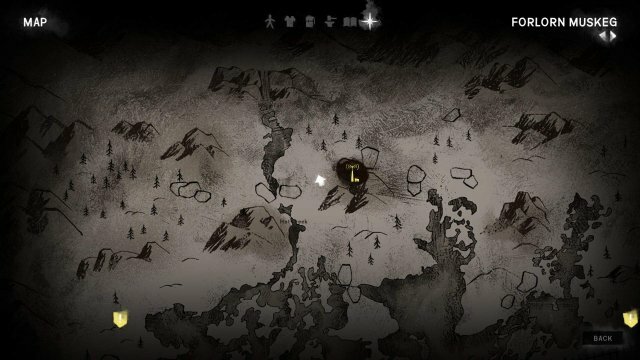 The side quest "Mystery Lake Supply Caches” is activated by picking up any of the notes triggering a supply cache marker on the map. The "Crumpled Note” in the outer room of the Admin Office in Carter Hydro Dam triggers the subquest to find the cache in Alan’s Cave near the Hunter’s Blind along the river north of Mystery Lake. The "Illegible Note” on the desk in the Abandoned Lookout triggers the subquest to find the cache near the entrance to Forlorn Muskeg at the end of the railroad near the bottom of the map of Mystery Lake. The "Blood Soaked Note” beside the Frozen Corpse in Forlorn Muskeg triggers a quest to find a cache in the Broken Railroad ravine near the frozen river by the waterfall north of the Landslide over the railroad tracks. 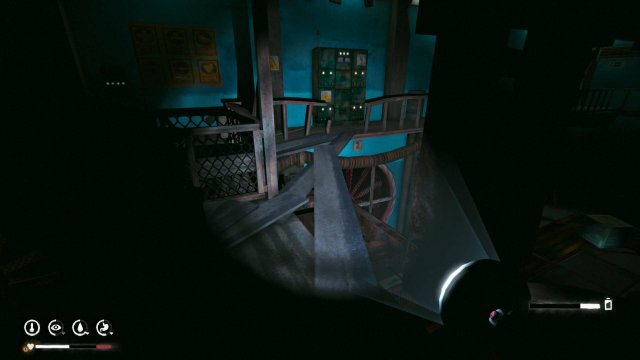 The "Handwritten Note” found taped to the side of the entrance stairs to the Hunting Lodge in Broken Railroad triggers the subquest to find a cache just north of the Hunting Lodge. The "Charcoal Note” found inside a truck at the end of the railroad tracks in Broken Railroad leads to a cache hidden under some tree roots in Forlorn Muskeg on the lake north of the Old Spence Family Homestead and south of the overturned rail cars by the entrance to Broken Railroad. The "Lake Gunshots” side quest is triggered by picking up one of the two identical "Crumpled Notes” in the Maintenance Yard building in Broken Railroad. First, you will need to head to Mystery Lake. On the ice near Lake Cabin #3 is a Frozen Corpse with a blood trail leading to one of the cabins. 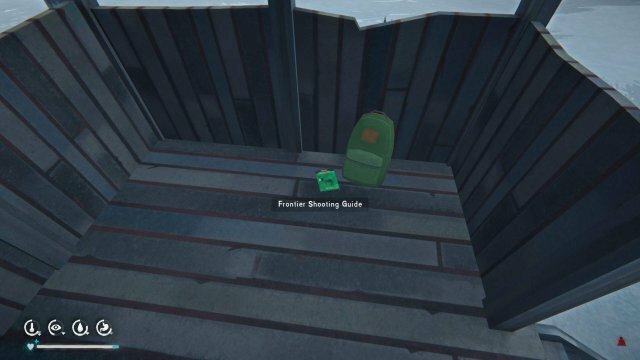 The door is locked, but if you attempt to open it, the Forest Talker hiding inside will speak and ask you to retrieve some items from Carter Hydro Dam: the "Forest Talker Documents” under a Loose Tile at the bottom of the stairwell and the "Forest Talker Supplies” backpack from the Logging Camp in the trailer beside the port-o-potties not next to the burned-out building. 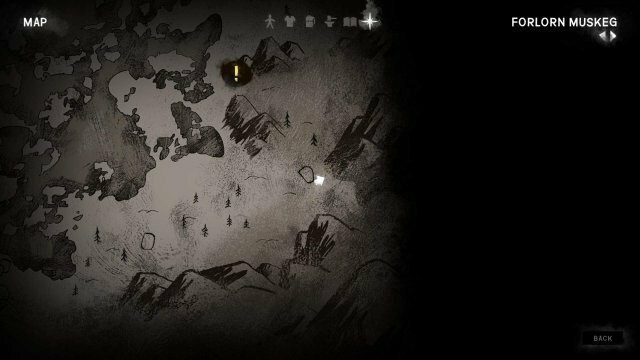 Return to the Mystery Lake cabin with the two required items, and the Forest Talker will ask you to leave the supplies outside the cabin door. You will have the choice of whether to give him the supplies you found or to remove the ammunition from the supplies. The next day the cabin will be open, and a pair of Deerskin Pants will be sitting on the desk beside a note. 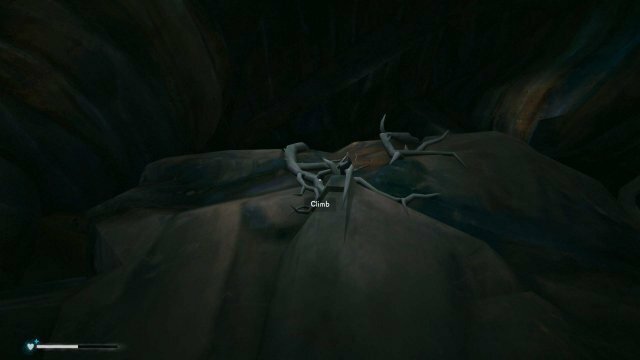 The side quest "Forest Talker Supply Caches” is triggered by finding the "Forest Talker Note” in the basement of the Hunting Lodge in Broken Railroad. 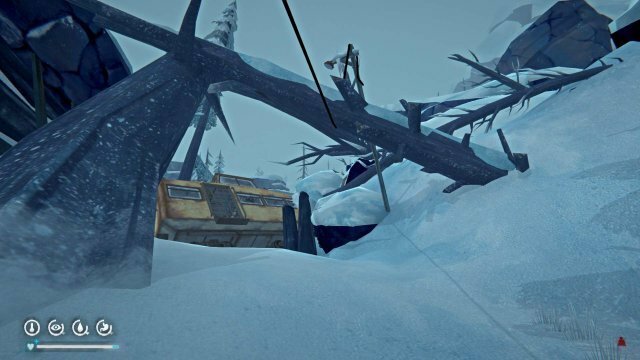 You will need to find three caches: one in Mystery Lake, One in Forlorn Muskeg, and one west of the Maintenance Yard in Broken Railroad. The side quest "Aurora Hatch” is triggered by finding the "Aurora Hatch Door Entry Code” inside the Hidden Cache located north of the Hunting Lodge in Broken Railroad found using the "Handwritten Note.” The hatch is located north of the north Shortwave Tower in Forlorn Muskeg and east of the waterfall. 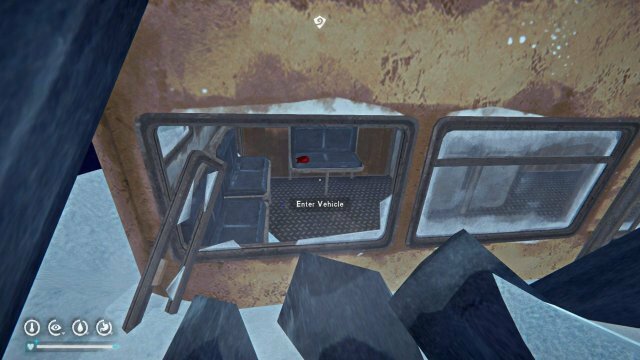 You will not be able to enter the hatch except during an Aurora night. 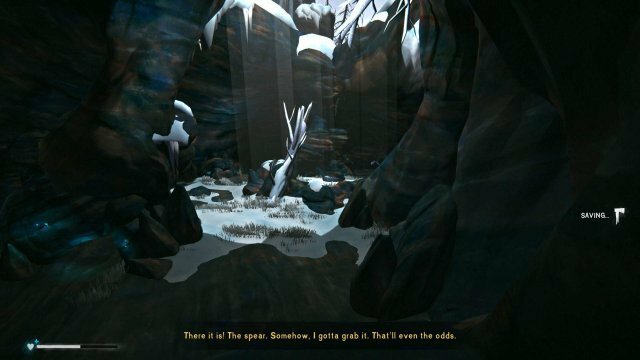 The side quest "Hank’s Hatch” is triggered by finding "Letter to Hank’s Niece” on the Frozen Corpse beside the infinite fire at the Unnamed Pond in Mystery Lake. 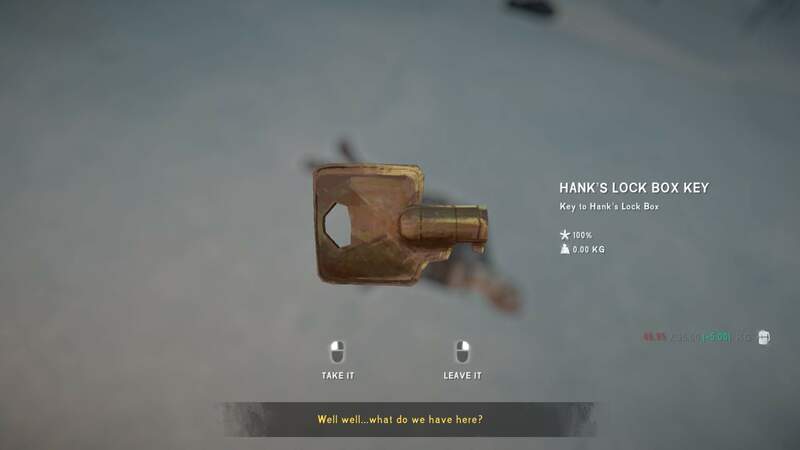 The corpse also contains "Hank’s Lock Box Key.” Use the key on the lockbox under the bed in the Abandoned Lookout. The box contains "Hank’s Prepper Cache Code,” and opening the box updates your map with the location of Hank’s secret prepper hatch. Locate the hatch in the mountains north of the Train Loading Area and west of Carter Hydro Dam. 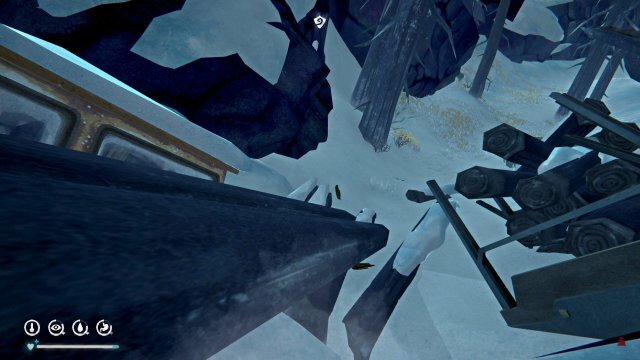 There is a Frozen Corpse beside the hatch, so you can follow the crows to the entrance. 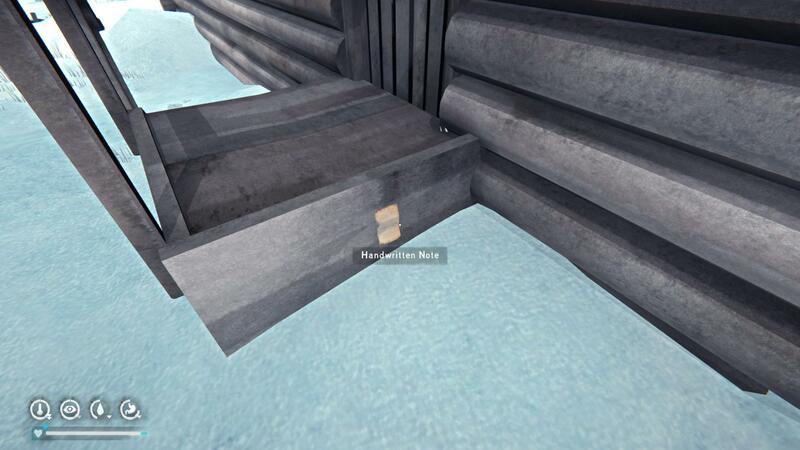 Use the code to open the lock on the hatch, and then you can enter and loot the cache for supplies. There is an impressive stash of both food and water, as well as some higher-tier clothing items. 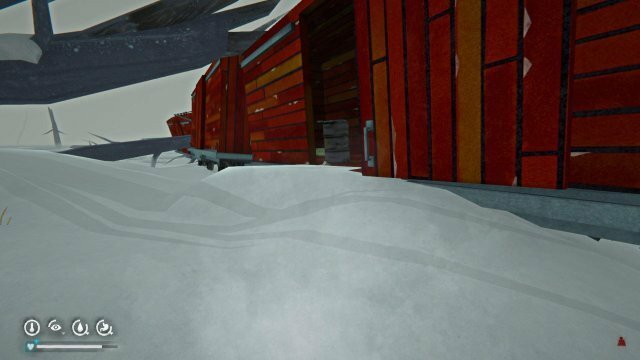 The "Key to Lake Cabin #2” is found on a Frozen Corpse by the Hunter’s Blind along the river north of Mystery Lake. The "Key to Lake Cabin #3” is found in the Mystery Lake Camp Office in a filing cabinet, second drawer from the bottom. Inside the cabin is an Urban Parka on the bed. The "Carter Hydro Staging Area Gate Key” is found on the desk in the trailer farthest from the train bridge leading to Carter Hydro Dam. The key unlocks the chain-link fence gate leading to the Carter Hydro Dam entrance. The "Admin Office Key” is found on a Frozen Corpse in one of the stalls in the Restroom on the ground floor of the Carter Hydro Dam. 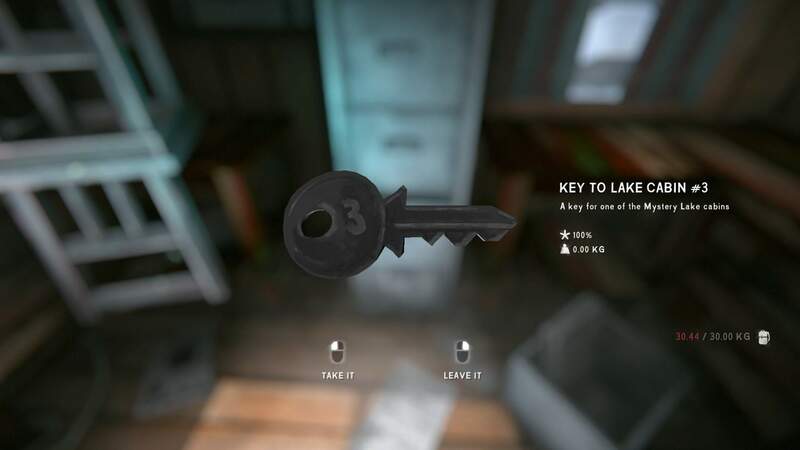 The "Logging Camp Trailer Key” is given to you by the Forest Talker victim hiding in one of the Mystery Lake cabins as part of the "Lake Gunshots” quest. It opens one of the trailers in the Logging Camp. The "Park Notice” is on a desk in the Mystery Lake Camp Office. The "Mystery Lake and Area” pamphlet is atop a desk on the second floor of the Mystery Lake Camp Office. The note "Off Season Fun” is found on the desk in Lake Cabin #2, which requires a key to unlock. The "Convict Journal Entry” is found in the green Backpack beside the Frozen Corpse leaning against the north face of the rocky outcropping of the final bend in the frozen riverbed leading to Mystery Lake. The "Breyerhouse Winter Crew Warning” is found on the desk in the trailer farthest from the train bridge leading to Carter Hydro Dam. 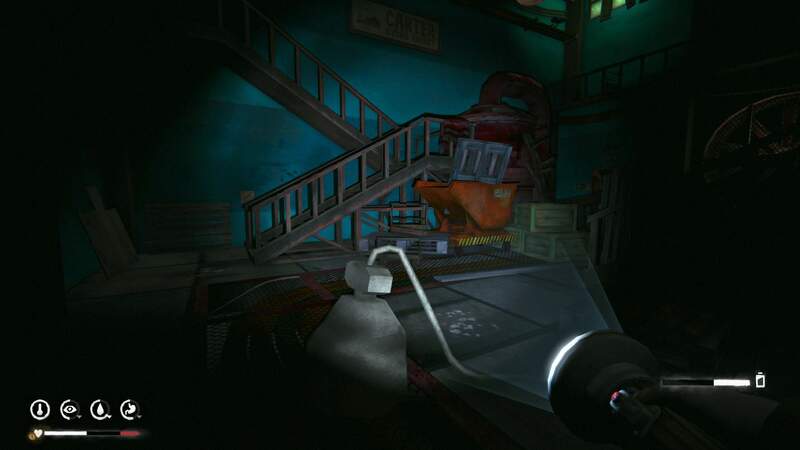 The "Carter Hydro Dam” pamphlet is found on the corkboard behind the desk near the front entrance inside Carter Hydro Dam. The "Carter Hydro Dam—Safety & Shutdown Notice” is found on a desk in an office near the elevator on the ground floor of Carter Hydro Dam. The "Forest Talker Dam Note” is found on a Frozen Corpse in one of the stalls in the Restroom on the ground floor of the Carter Hydro Dam. The "Trash Can Note” is found in the Trash Can next to the sinks in the Restroom on the ground floor of Carter Hydro Dam. 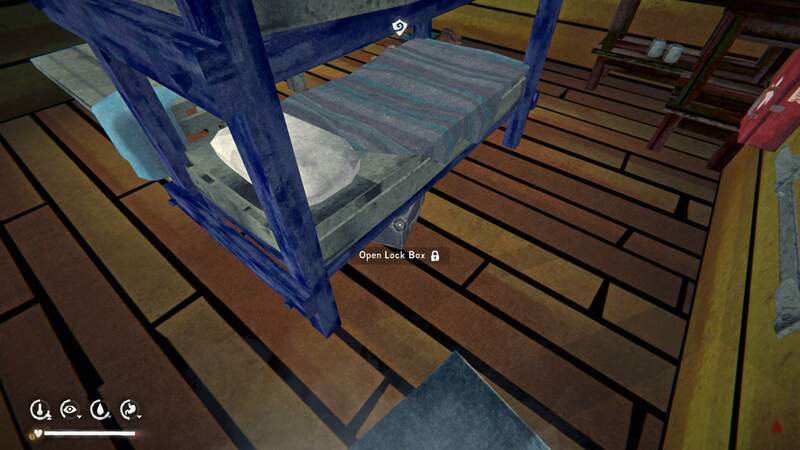 A "Crumpled Note” is found on the desk in the Admin Office outer room in Carter Hydro Dam. The note activates a side quest to find a Mystery Lake supply cache. 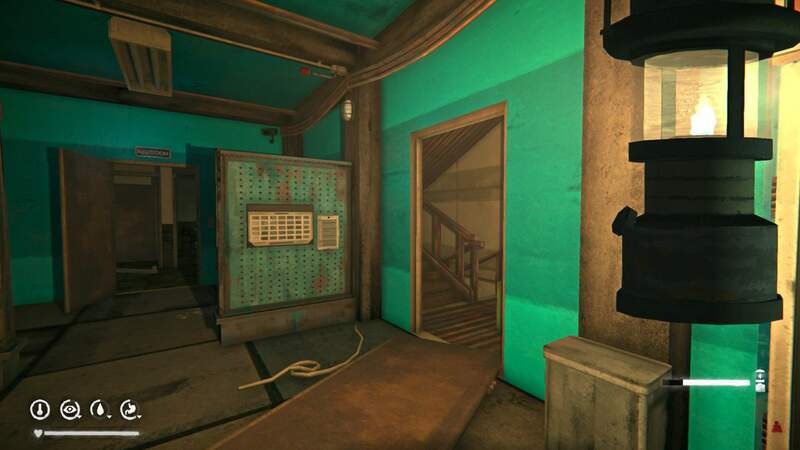 The "Elevator Maintenance Note” is found on the desk in the inner room of the Admin Office in Carter Hydro Dam. 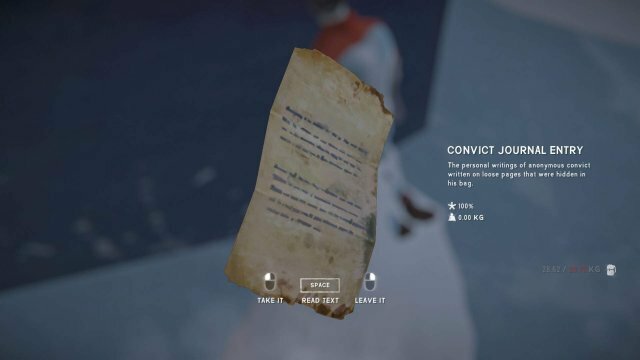 An "Illegible Note” is found on the desk in the Abandoned Lookout in Mystery Lake. The note activates a side quest to find a Mystery Lake supply cache. 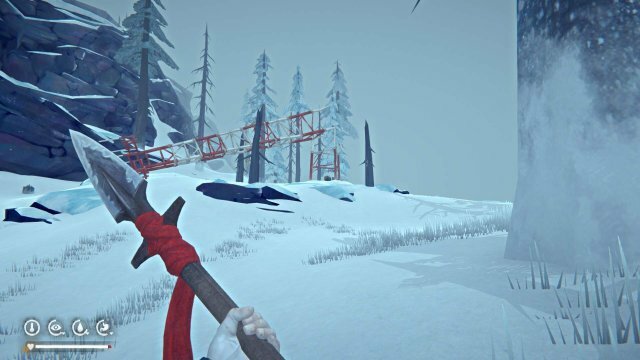 The "Blood Soaked Note” is found beside a Frozen Corpse at the Train Derailment on the far side of Forlorn Muskeg near the entrance to Broken Railroad. The note activates a side quest to find a cache in Broken Railroad. A "Crumpled Note” is found on the bench immediately inside the entrance of the Maintenance Yard building in Broken Railroad. Picking up the note triggers the "Lake Gunshots” side quest. This note is identical to the one found in the Maintenance Shed. 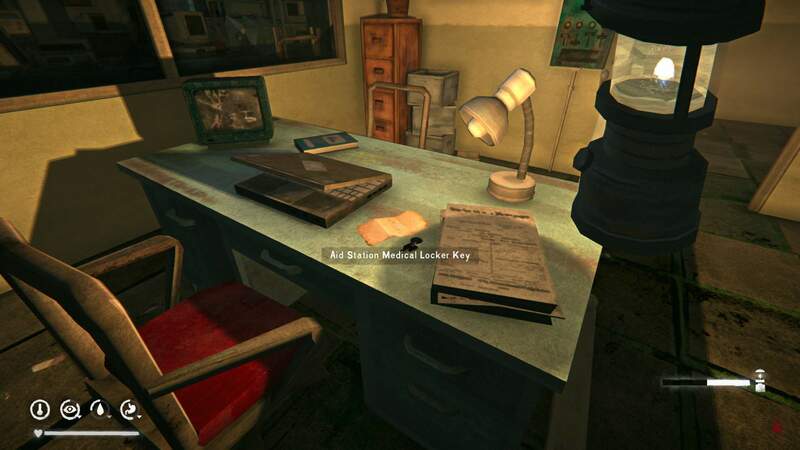 The "Aurora Observations” note is taped to the computer on the desk inside the Maintenance Yard building in Broken Railroad. 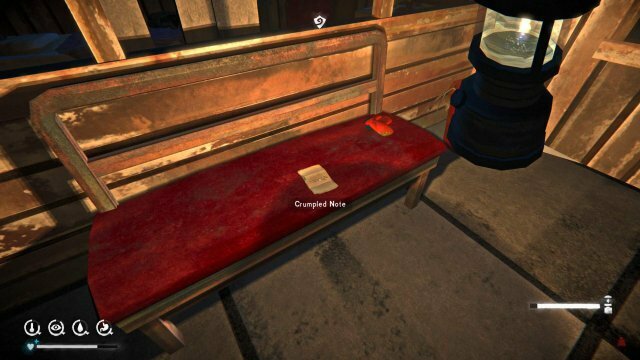 Another "Crumpled Note” is found on a chair in the office of the Maintenance Shed in Broken Railroad. This note is identical to the one found in the Maintenance Yard building. 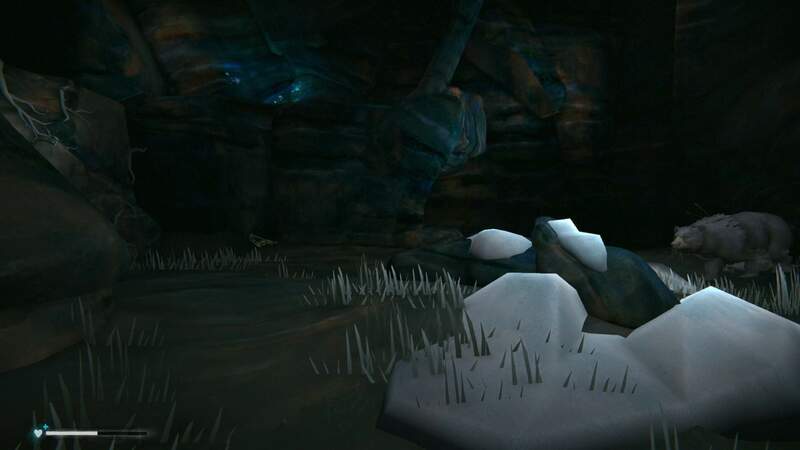 The "Forest Talker Flyer” is found beside the Frozen Corpse in an alcove near the Forge in the far right corner of the Maintenance Shed in Broken Railroad. The "Handwritten Note” is taped to the side of the entrance stairs to the Hunting Lodge is Broken Railroad. The "History of the Collapse, Part Three” is on some shelves beside the stairs in the Hunting Lodge in Broken Railroad. The "Aurora Hatch Door Entry Code” is inside the Hidden Cache located north of the Hunting Lodge found with the "Handwritten Note” in Broken Railroad. 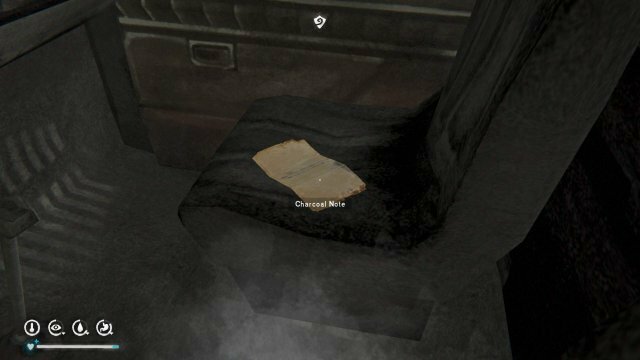 The "Charcoal Note” is found in the truck beside the yellow train car at the end of the railroad tracks in Broken Railroad. Enter the truck on the driver’s side to be able to pick up the page. The note triggers a quest to find a cache hidden under some tree roots in Forlorn Muskeg on the lake north of the Old Spence Family Homestead and south of the overturned rail cars by the entrance to Broken Railroad. The page "Hank’s Journal—Part Two” is found on the floor inside Hank’s prepper cache. 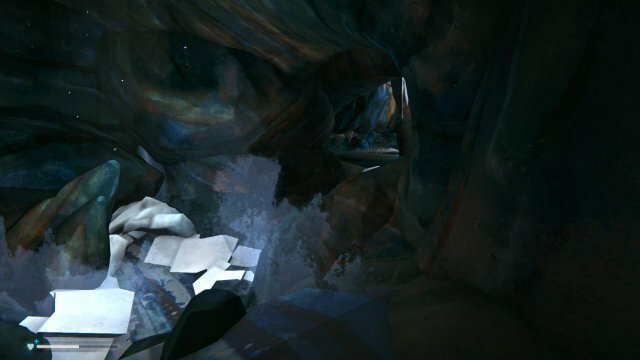 The "Torn Paper” is found on the Frozen Corpse in the left-hand fork of the bear’s cave.